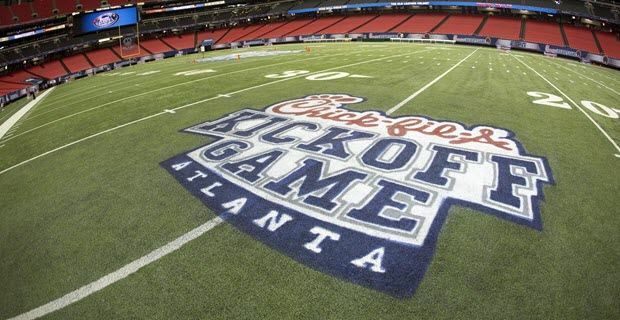 – Just when you think that Louisville is rolling again under second, non-consecutive term head coach Bobby Petrino (paging Grover Cleveland), the Cards lay an egg on the road. Virginia is not that bad of a team, but that is still no excuse for all the quarterback miscues that seemed to plague U of L throughout the game, leading to the disappointing result. Perhaps Petrino should consider playing the freshman QB? – Virginia Tech seems nothing if not consistent when it comes to losing games the week after winning a big one. – They say that football can be a game of inches. In the case of South Carolina upsetting intra-conference and border rival Georgia, it was a game of one inch. Period. Well, that and a good (favorable?) spotting of the ball by the refs after 4th and one inch. – Perhaps Oregon might have been saving a little energy for future endeavors later this season. How else might one explain a win over Wyoming by a score of only 48-12? Given how well the Ducks have played thus far, you’d think the Cowboys got off easy. – Did Purdue acquit themselves against No. 11 Notre Dame, or are the Fighting Irish that mediocre? In the wake of the Boilermakers embarrassing themselves at home last week to Central Michigan, coupled with ND demolishing Michigan, one would have thought that the annual in-state rivalry game would have meant utter demolition for Purdue. Instead, the Boilers ended up leading, however briefly, in the first half, scoring two touchdowns on the Irish. Such an effort compelled Notre Dame to increase their efforts, allowing them to gradually win over the course of the second half, 30-14. The reason that so many people naturally incline towards the former answer is that they want to believe the Notre Dame hype (it sells, after all!). But what we keep learning, and continue to have to keep learning over the past 10-15 years, is that Notre Dame is once again overrated. The real question, therefore, to consider is, how bad is Michigan? 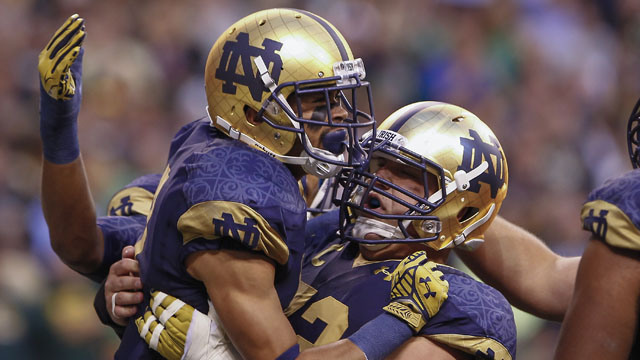 – That being said, Notre Dame’s helmets for that game did look rather neat. It is a long time coming that they incorporated a blue “ND” logo on to their gold shells. The single, blue center stripe was a nice touch, too. The jury is still out on the latitude-longitude, “globe lines” effect, though. Moreover, I can do without that weird brocade effect on the shoulders of the jerseys. – Is Texas in trouble? First, they lost ignominiously at home to BYU last week. Then, they lose to an increasingly good UCLA team, ostensibly at a neutral site, though hardly anybody could consider the Horns playing in Dallas as playing on neutral turf, be it the Cotton Bowl or AT&T Stadium. Yes, Jim Mora has truly breathed intensity into the Bruins program at Westwood, Calif., but there is still no excuse for such a proud, tradition-and-resource laden program as Texas to suffer two such consecutive losses. Is Coach Strong in over his head at Austin? It would be a very painful thing to acknowledge, to be sure. The wise thing, at this point, is to allow the rest of the season (and how it plays out) to answer that question. – If we were to apply the law of transitive properties, just how badly would Syracuse beat Purdue if the two played each other right about now? A day of upsets and near-upsets: that is how one could characterize Week Seven. True, many favored teams survived the week unscathed. For example, Louisville convincingly beat an underrated Rutgers team to maintain their top-ten ranking. Texas Tech at No. 20 survived a surprise onslaught from Iowa State and beat the Cyclones by a touchdown. Then there is No. 14 South Carolina, who obliterated Arkansas, 52-7. No. 11 UCLA had little trouble against Cal, and No. 15 Baylor beat Kansas State by 10 points – unimpressive compared to previous victories this year, but a “w” nonetheless. No. 9 Texas A&M managed to survive a 4th quarter scare on the road against Ole Miss. Meanwhile, No. 1 Alabama keeps rolling along, and No. 2 Oregon handily beat a strong No. 16 Washington team, 45-24. With all of that said, all the upsets practically turned the rankings – under the top four, at least – upside down. To wit: No. 25 Mizzou took out No. 7 Georgia between the hedges. Apparently, beating LSU at home then being giving another strong contest the following week at Tennessee made those two past wins Pyrrhic, in hindsight. Speaking of games taking more than usual out of a team, losing to Ohio State at home most have done that to Northwestern, for even at No. 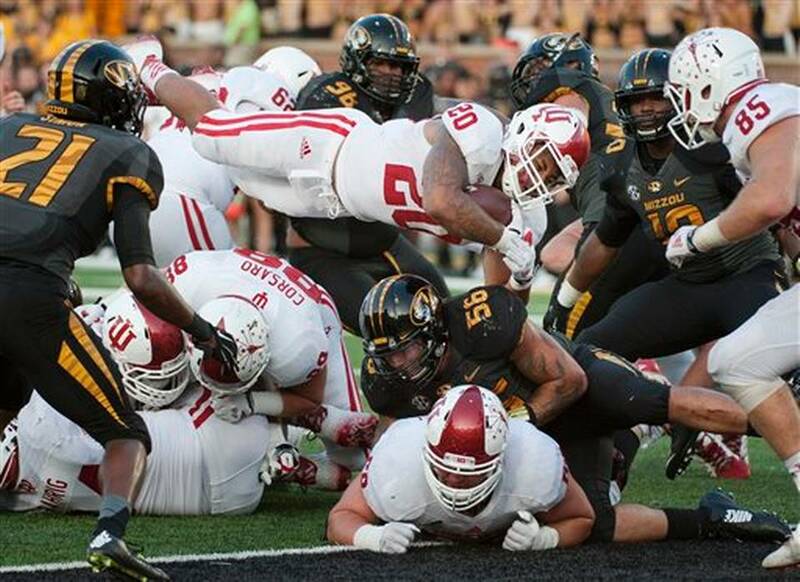 19 – despite last week’s loss – they laid an egg on the road to unranked Wisconsin, 35-6. Michigan, hitherto at the 18th ranking, allowed for unranked Penn State to squeak by them in triple overtime. Need we rehash the Red River Shootout? Everybody, yours truly included, had given Texas up for dead. Yet the Longhorns came out swinging against the No. 14 Sooners, delivering a power rushing attack between the tackles, and doing so effectively. Usually, over the course of a decade, it was Oklahoma who always had a runningback to ruin Texas’ day. This time, it was oddly the other way around. Never before has crow tasted so good. To cap things off, unranked Utah upset No. 5 Stanford 27-21.